Sarcasm is targeted whereas as Snark is free-floating; Sarcasm depends on tone, facial expression, and body language to make the victim and any other audience understand. He inserts a thoughtful *(S) in the text to ensure that no sarcastic nuance is missed. In Dorman’s hands Sarcasm is a bludgeon not a rapier. 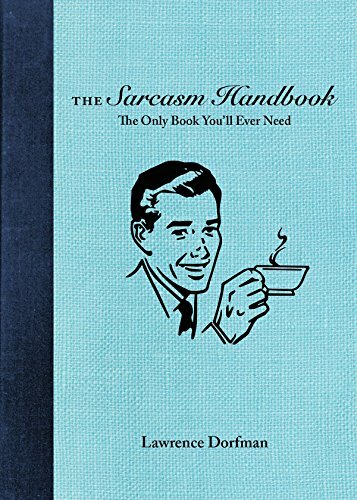 As the author acknowledges in passing the idea of a handbook for Sarcasm seems to deny essence of Sarcasm. Sarcasm requires spontaneity, wit, irony, and a strong sense of superiority all of which might preclude the purchase of a Handbook. Although it is often associated with social superiority it can also be underdog humor. The dedicated Sarcastic do not care whether the victim or audience “gets it” and to produce a truly resonant and complex sarcasm is a pleasure in itself to be savored in solitude. Nevertheless Dorfman is to be commended for taking on a task that many experts would regard as impossible. And this neat little book will be a handy gift for the aspiring Sarcastic and those who want to complete the series.